Founded in 1881, the City of Helper was named for the "helper" locomotives that were needed to push the heavy coal trains over the steep mountain grades. As the town began to grow, scores of immigrants moved to Helper to find the American Dream toiling on the railroad and in the nearby coal mines. The largest of the groups came from Italy, followed closely by the Greeks and the Yugoslavians. Helper soon became known as the town of 29 varieties -- even though there was a giant "57" on the hill which referenced the steak sauce's commercials. Those immigrants have left behind a legacy that still flavors the City of Helper, Utah. Helper's Historic Main Street is listed on the National Historic Register preserving it's unique heritage. Today, Helper, Utah is a thoroughly modern city boasting a population of nearly 2,000 people. Helper offers visitors and permanent residents numerous business and recreational opportunities for everyone. Due to issues with Helper City, Heritage Week and its operation have been turned over to a non-profit organization that is NOT associated with Helper City Corporation, nor the Western Mining & Railroad Museum. For the last couple of years Heritage Week was financed and orchestrated by Teply Graphic Arts & Publishing, LLC for the benefit of the Western Mining & Railroad Museum. New "issues" with Helper City Corporation caused the Heritage Week Committee to turn Heritage Week over to a more deserving entity. Darrin Teply, Director of the Eastern Utah Tourism & History Association stated, "after the apparent misappropriation of funds from last year's Heritage Week by Helper City Corporation, (I) will see to it that this fine event will continue and that monies will actually make it to worthwhile projects that will better this community." 2008 Heritage Week's Bordello Ball raised $1019 for the Western Mining & Railroad Museum's Building Expansion. Unfortunately, it appears that the money went into Helper City's General Fund instead of the Museum's Building Expansion Fund as directed. This apparent misappropriation of money lead to an investigation by the Western Mining & Railroad Museum's Director and Board, with amounts potentially being more than $135,000 missing from the Museum's Expansion Fund. The Mayor has stated that those "earmarked monies will be pushed out of the General Fund and pushed into the earmarked accounts someday." However, when the Western Mining & Railroad Museum Board demanded to know exactly when, the Mayor refused to answer. Unfortunately, Helper City's response was to create a smokescreen "Audit turned Witch Hunt turned Inquisition" complete with threats of physical violence and dismissal of the Western Mining & Railroad Museum's Director, Board and volunteers for questioning the location and inaccessibility of those monies and questioning the actions of its assigned Councilman. These actions and comments by the Museum's Councilman and of the Utah State Auditor's Office has caused many to opine if this is a "group of rogue auditors abusing their office while receiving financial benefits." Originally designated as a one day audit, this Inquisition is now firmly in its fourth month of failed muckraking and wasting of tax payer dollars. Museum Director SueAnn Martell said, "only under Helper's current administration can you raise $1.5 million dollars for Museum projects and then have your job threatened and be personally threatened, slandered and libeled. This is a sad situation for a small town that is just struggling to stay alive." This situation is further becoming a quagmire due to Helper's Mayor, the Museum's Councilman and the City Recorder's further attempts to smother the Museum Board and its Director by ignoring and overriding established City Ordinances and the Western Mining & Railroad Museum's by-laws. Museum, special events supporter and tourism professional, Darrin Teply, said "this whole situation has gone beyond ridiculous, Russian Museums and their staff were treated better during the collapse of the Soviet Union than the Western Mining & Railroad Museum is being treated now." December 9, 2008 :: Iceberg Mascaro Destroys Museum's "Unsinkable" Ship. Today, due to extensive levels of harassment and City corruption, Western Mining & Railroad Museum Director SueAnn Martell and Assistant Director Brande Sherman "resigned under duress." Following harassment tactics by Helper Police in yet a third Witch Hunt investigation, Martell, Sherman, 25 Museum volunteers, most of the voting Museum Board members and some of the Museum Expansion Committee tendered immediate resignations. Additionally, gift shop vendors pulled their consignment merchandise and temporary loan exhibits were removed by their rightful owners. "I fail to see that when we're accusing Councilman Mascaro of wrongs with the Museum, he can be expected to run an 'impartial City investigation' -- especially when he's harassing, slandering and defaming us," said Darrin Teply. "It's like asking Richard Nixon's corpse to provide the missing 18 minutes of the Watergate tapes -- it's still not going to happen." Teply added "It's become obvious that Helper's Unholy Trinity will just continue to create Kangaroo Court Investigations supported with the blind backing of most of the City Council in closed doors sessions without checking any facts... furthering my opinion, I'm so damned proud that Helper is making Illinois look good... we've got Helper Police and Councilmen yanking laws that aren't written in any books out of their butts and threatening women and their families... can you say 'coercion?'" Here is a copy of SueAnn Martell's Open Letter of Thanks to the citizens of Helper and Carbon County. February 5th, 2009 :: Helper City Councilman Jensen Resigns; Disgusted with Levels of On-going Corruption. You all have asked about the on-going situation in Helper and all of the B.S. slanderfest and other "Boss Hogg Games" going on. I think the attachment at the end of this post more than points to the true problems within Helper. In my opinion as a tourism professional, Helper business owner and as someone who put over a thousand hours of volunteer time and several thousand dollars more of volunteer services and finances into the Helper Museum (not to mention that I still have a valid RFP contract with Helper City Corporation); it's sad that in losing Councilman Jensen, we lost the ONE councilman who was actually working towards improving Helper, the ONE councilman who actually came down and actually participated in all Museum events, the ONE councilman who actually asked questions and listened, the ONE councilman who actually came down and looked over and read financial records and the ONE councilman who worked towards promoting the City's tourism and economic resurgence. In my opinion, it's an even sadder situation that both Utah State Government & Federal Government admitted to knowing that this government corruption was a normal situation for Helper (even citing Dagget County as worse), but yet refused to do anything about it... if this was the Wasatch Front I'm sure that they'd be all over it. I'm conservatively estimating that a minimum of $30,000 of tax payer money (auditor salaries, travel and other expenses) has now been wasted in this on-going Witch Hunt (audit) by the state... with zero concrete results other than yet more innuendo and rhetoric from Helper City Corporation based on extremely questionable statements and City records! (Some falsified/misleading records which were already admitted by the City Recorder in Council meetings to be created from non-existant sources.) It's even sadder that the State of Utah and Carbon County claim that they have almost no money for tourism and museums, yet money is being wasted on this unproductive Witch Hunt! Maybe it's time for Carbon County to take over Helper City Government. Hopefully, the local media (yes, that's you Sun Advocate) won't drop the ball again... it's called "research your facts and statements before publishing" C.J.! Here is a copy of ex-councilman Phillip "P.J" Jensen's Open Letter of Resignation to the Citizens of Helper and Carbon County. Image Replicas Mercantile is proud to be the only on-line source of signed copies of Rails Around Helper! 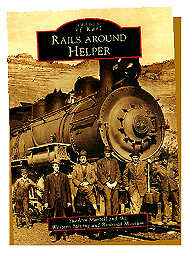 Rails Around Helper is the newest book in Arcadia Publishing's historical "Rails Around..." series. This 128 page book tells the almost 100 year story of the Rio Grande's treacherous route between Soldier Summit and Provo, Utah and all of the towns that were created in between to service the railroad line. Rails Around Helper features newly restored photos by Teply Graphic Arts & Publishing, LLC and never before seen photos from museum archives and from private collections. SueAnn Martell's second book is now available! Coal Camps of Eastern Utah shows the history of the coal mining towns that surrounded Helper and supplied the railroad. Now ghost towns, these mining company "camps" ranged from cramped tent cities and tar paper shacks to large Italian stone and red tile townships. Photos for Coal Camps of Eastern Utah will come from the museum, private collections and Image Replicas Mercantile. Once again, Image Replicas Mercantile is the only on-line source for signed copies! In our "It Happened In Helper" section we have more event information, photos and a poster still available from one of the Rails Around Helper Book Signings. Helper is brimming with culture, activities and adventure. Spend some time exploring the Western Mining & Railroad Museum. Take a tour of ghost towns. Browse the antique shops, art galleries and specialty stores. Unwind with a stroll on the Helper Parkway or the Spring Canyon Trail. Helper has it all. Part of the Destination Diversions website series. This site designed, maintained and copyrighted (c) 2007-2009 Teply Graphic Arts & Publishing, LLC. All rights reserved worldwide. All opinions and facts expressed on Destination Helper are those of the owner, Teply Graphic Arts & Publishing, LLC, which are backed up with evidence and are protected under the 1st Ammendment. This content is NOT supported, endorsed nor appreciated by Helper City Corporation. christmas town festival, utah, helper, rails around helper, western mining railroad museum, christmas town, helper, town christmas, helper, utah's christmas town festival.